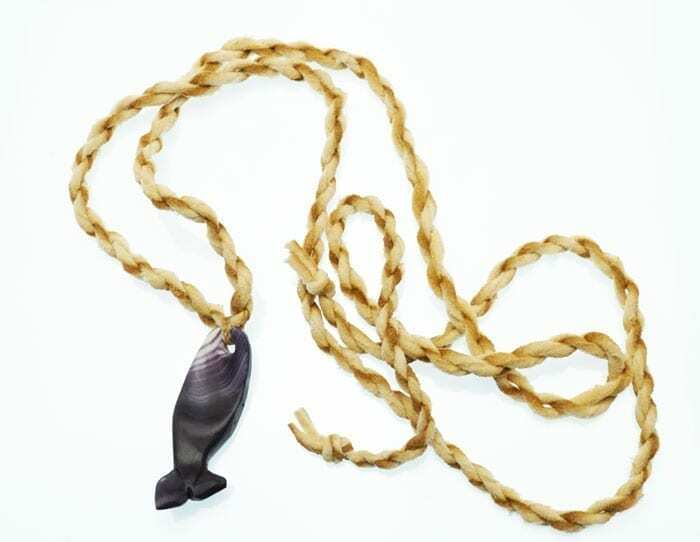 A necklace in the shape of a whale effigy by Wampanoag artist Elizabeth James-Perry, hung on very soft Native-tanned deerskin. The artist selects her shells carefully and cuts and finishes them all in the traditional way, by hand, to preserve their attractive contours and colors. The contours are difficult to display in two-dimensional photographs, but they add a lot to the visual aesthetic when seen in person. 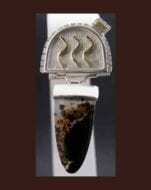 Wampum has been used by coastal tribes for thousands of years. Items made from quahog shells, commonly called wampum, are culturally significant to New England tribes and are held in great esteem within families and within tribes. Perry hand selects each quahog shell for color and other qualities. She continues this traditional work form as a way of honoring her connection to her ancestors, their history, their way of life, and the ocean that sustains them. 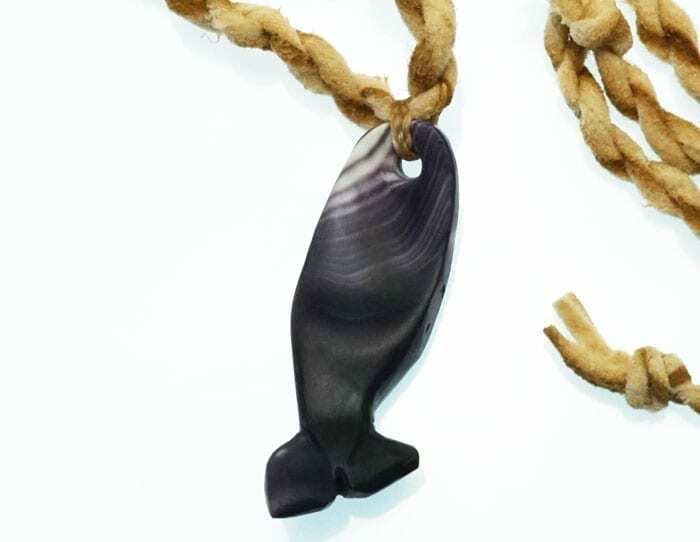 Whale pendant is 1 7/8 inches high x 5/8 inches at its widest x 3/8 inches thick. Deerskin cord is 42 inches long, so it can be tied at any desired length. Materials: quahog shells, Native-tanned deerskin. Floral design bracelet. 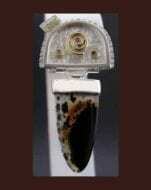 Kevin Pourier meticulously carves buffalo horn surfaces and inlays them with crushed stone and shell. Buffalo horn is so light, the jewelry is featherweight. The jewelry is finished beautifully, adding a soft, satin touch to the experience.<br><br>Materials: buffalo horn inlaid with crushed lapis lazuli, mother of pearl (white and gold), sandstone. Gold fill findings.<br><br>Bracelet will fit wrists up to 7 1/2"; will fit smaller wrists by choosing different jump rings.<br><br>Each lozenge is 1" x 3/4"
Sterling silver post earrings with gold overlay touches. The translucent Montana agate stones allow for the passage of light, creating a beautiful effect. 1 1/2" x 3/4"